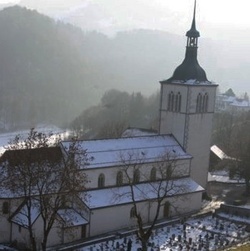 In the Swiss Alps, 810 m above sea level, lies the perfectly preserved old castle-village Gruyères. In this photogenic location Phillipe Mottet-Rio organised with his team the 6th Atelier de musique ancienne. This year's theme was "Schubert's guitar". Raphaella and Philippe met for the first time 21 years ago, when Philippe participated at Raphaella's 4th summercourse "The International Guitar Happening 1987" in Corsendonk, Belgium. 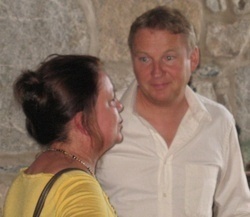 Now, Philippe had invited Raphaella to give masterclasses on Thursday and Friday, August 28 & 29, 2008. 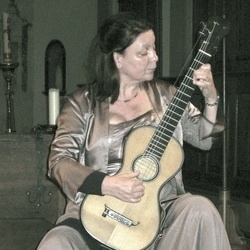 She also performed a Romantic recital on Saturday August 30 at 8 p.m. in the church of Gruyères. Philippe Mottet-Rio, artistic director of "Anselmus". 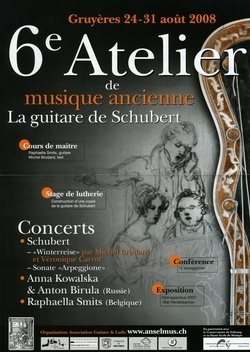 In 2003, the luthier fribourgeois Philippe Mottet-Rio launched the Atelier de lutherie et de musique ancienne, organized by the Association Guitare & Luth. He wanted to share his passion for early music, its interpreters, and for early instruments manufacturing by the authentic models. As a luthier specialized in plucked instruments, establised in Bulle/La Tou-de-Trême with brand name Anselmus, he made many orders for an international clientele: copies of lutes and guitars ranging from the 16th to the 21st century. He is at the same time guitarist and professor of music at the Conservatoire de Musique du Canton de Fribourg. Philippe Mottet-Rio cultivates with inspiration the art of the humanistic philosophers and writers from the golden age and the Renaissance.